In the last blog post we mentioned the most useful feature of your chess software program(s), one which tabletop and handheld standalone chess computers lack: the ability to analyze complete games. Today we’re going to start exploring these game analysis features, specifically the ones in the Fritz12 interface (also shared by the ChessBase versions of Rybka4, Hiarcs13, Shredder12, and Junior12). After launching the program and getting to the main chessboard screen, you’ll first want to load the chess engine you wish to use for analysis. The shortcut for this is the F3 key, but you can also go to the “Engine” menu and click the “Change Main Engine” button (on the far right). Select your engine from the scrolling list and be sure to set the hash table size according to the instructions given in a prior post to this blog. …then click on the book you want to load. If necessary, use the dialogue to navigate to the folder where the specific book is located. Now that you have the engine and the opening book loaded, you can go to the game list to select the game you want to analyze. Click on the “Home” menu and then the “Database” button, or else just hit F12 on your keyboard to go to the game list screen. You’ll see a picture of Leo (That’s what I call him. I have no idea what his name really is, but if there was ever a guy who ought to be named “Leo”, it’s him). There’s also a variety of settings within this dialogue, settings which we’ll briefly describe in this post. “Calculation time” should be what you look at first. “Per game” is, in my opinion, dumb – don’t use it (it’s so silly that I don’t even know why it’s there). As far as the “Per move” setting goes, you can set it for whatever you like but you’ll need to consider my commentary in a previous post to this blog: the more time you give the engine to analyze, the better the analysis you’ll receive in return. 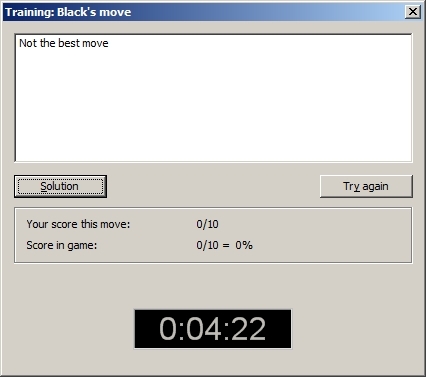 The “proper” time per move is going to depend on your hardware (number of processors/cores and whether or not you have a “Deep” version of the chess engine which takes advantage of that extra power) and how much time you have available to let the analysis run. 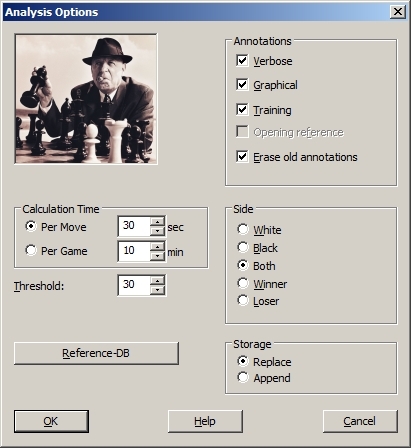 When you talk to experienced chess software users (either online or in person), you’ll often hear them refer to “overnight analysis” of a game; this is because a decent game analysis often takes hours to complete, so many users of Fritz and other chess engines start a game analysis when they go to bed, allowing the process to run overnight. For example, I ran an analysis at sixty seconds per move on a short (twenty-eight move) game last night and after running for ninety minutes the Fritz12 engine wasn’t even half finished when I turned in. So play around with the process to find what works well for you, but in general a setting of thirty to sixty seconds per move should be sufficient on present-day computer hardware. That usually results in an analysis process which takes two to four hours and allows the engine to reach a decent search depth on each move. “Threshold” is a value expressed in 1/100ths of a pawn, and controls how much analysis you receive from the chess engine. For example, if you set this value for “500”, you won’t see a recommended improvement from the chess engine unless the game’s actual move lost a Rook or more. If the value is set to “300”, the software won’t offer a recommended line unless a move in the game lost at least a minor piece (Knight or Bishop). For beginning players, I recommend a setting of “100”, meaning that if you made a move which lost a pawn or more, the chess engine will show you how you could have played better. For players with more experience, I recommend a setting of either “50” (moves which lost a half-pawn) or “30” (moves which lost the equivalent of a tempo). My personal preference is for the latter. The higher the “Threshold” setting, the fewer moves you’ll see analyzed. Conversely, the lower the setting, the more analysis you’ll see (but a lot of that analysis won’t be terribly useful. We’ll talk more about that in the next blog post on Tuesday). 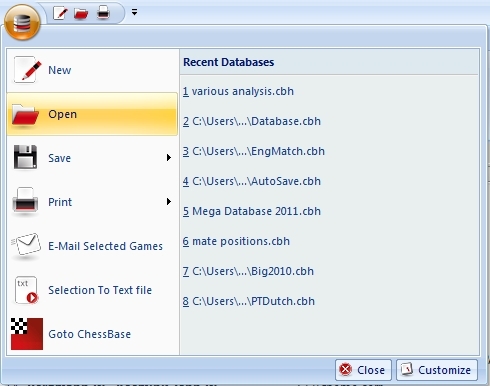 The “Reference-DB” button allows the software to search a database for similar games and drop some opening references into the game (similar to what you see in chess magazines). 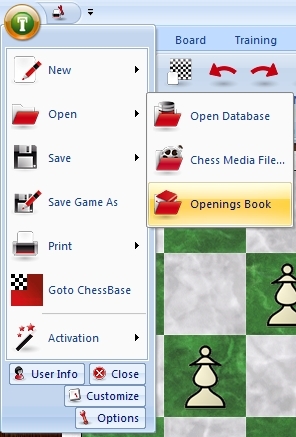 However, this tends to work well only if you have a database which includes an opening key with a very fine narrow hierarchal structure (such as a ChessBase database using Zunke’s “Superkey”), or else a separate database containing nothing but games with the same opening as the game in question. I often skip this setting. The “Side” setting should always, always, always be set to “Both”; the chess engine will do a better analysis job if it’s allowed to consider both players’ moves, plus you as a player will often be surprised at the moves your opponent missed (and some of that stuff can be scary – I’ve sometimes had an engine show me where my opponent missed a mate in four, and that’s pretty instructional for me). “Storage” has two settings. If you select “Append”, the program will save a second copy of the game into the database (and add it as the last game down at the bottom of the game list). You’ll end up with two of the same game in the database – the first will be the original unanalyzed game, the second will contain the chess engine’s analysis. “Replace” means that the original game in the database will be overwritten by the new version containing the chess engine’s analysis, and you won’t have a second version of the same game in your database. There are several choices available in the “Annotations” section. “Verbose” allows the chess engine to add short, descriptive phrases at various points during a game. “Graphical” causes the chess engine to add colored arrows and squares to the chessboard for emphasis where appropriate. “Training” lets the software add timed tactical training questions to a game, especially in cases where a gross tactical blunder has occurred. This won’t happen in every game and, in fact, the stronger a player you are the less likely you’ll see any of these questions appear in any of your analyzed games at all (primarily because you’re not likely to be dropping entire pawns or pieces in your games; your mistakes will tend to be more subtle than the tactical blunders committed by beginners). I’ll show an example of these timed training questions a bit farther down the page. “Erase old annotations” will wipe out any existing game annotations before the analysis process begins. Don’t check this box if you’re having the chess engine analyze a game to which you’ve added notes or a previously-annotated game (a GM-annotated game from a ChessBase database, for example)! After you’ve made your selections, click “OK” and the chess engine will get to work. You’ll notice that the engine begins analyzing from the final move of the game and works backwards through the game – this is normal, so don’t bug out! Just go away and let the chess engine analyze. While the engine is analyzing, you’ll see a “Stop” button appear near the upper left-hand corner of the screen; this is an “emergency” stop button you can click if you need to end the process for whatever reason. How will you know when the analysis is complete? For one thing, the “Stop” button will have gone away and the program interface will appear as it usually does. You’ll also see the word “Stopped” appear in the pane which displays the engine’s analysis. You’ll see a short replayable variation at every point where the chess engine found an improvement over what was actually played; each variation ends in an evaluation symbol (and if you don’t understand these symbols, you find their explanations in the program’s Help file). You can then click “Continue” to clear the training dialogue and resume viewing the game normally. Although your chess engine will analyze quite deeply (you’ll see this if you choose to watch the “Engine analysis” pane while the engine is analyzing), you’ll note that all of the variations provided here are rather short. This is because “Full analysis” is designed to be used primarily by beginning players, so the variations are kept short on purpose. There’s another analysis mode which offers more comprehensive (albeit somewhat more complex) analysis, and we’ll look at that in our next blog post.